Early 1800s rowhouse on West Broadway had undergone extensive ground-floor reconstruction and gained an additional floor. 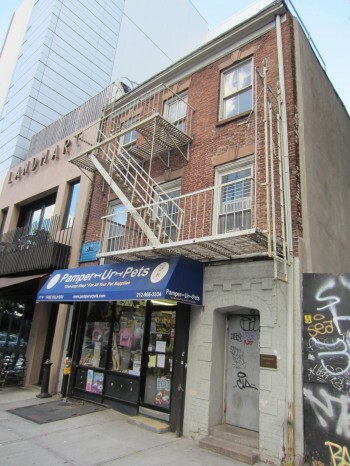 On June 26, 2012, Landmarks declined to designate a three-story Federal-style rowhouse at 177 West Broadway in Tribeca as an individual landmark. The rowhouse was built circa 1802 as a two-story building. It is one of the neighborhood’s earliest structures, and one of the few remaining Federal-style buildings in Manhattan. The building served as private residence in its early years and, according to Landmarks, also served as a brothel for a period of time. The building is currently occupied by a ground-floor pet store and actor Harvey Keitel’s production company. The building retains its original Flemish-bond brick and splayed lintels at the second floor. The existing third floor of the building was added in the mid-1800s, and the ground-floor infill is non-historic after undergoing extensive alterations. At Landmarks’s hearing in June 2010, Attorney Valerie Campbell, representing Shiloh Company LLC, which owns the building, opposed designation. Campbell argued that the heavily altered building did not merit designation because it retains only a “single one-story swath of original brick,” and lacks many of the features commonly associated with the Federal style. At the June 2012 meeting, Chair Robert B. Tierney noted the scarcity of Federal-style buildings in the City, but found the building’s extensive alterations “tipped it away from designation.” Tierney noted that only approximately one-third of the existing building is original. Commissioner Fred Bland concurred, stating that the original rowhouse had been so physically altered that it would not be comprehensible to the public as an individual landmark. Commissioner Joan Gerner determined that the building “just doesn’t come up to the quality” of other City landmarks. Commissioner Christopher Moore disagreed, finding that that the building’s origins and the remaining amount of original materials were sufficient to merit landmark status. Chair Tierney led a vote to decalendar the property. LPC: 177 West Broadway House, 177 West Broadway, Manhattan (LP-2347) (June 26, 2012).